MBC is bringing the tale of Korea's first reigning Queen Seondeok to the small screen through its new drama ``The Great Queen Seondeok'' next week. Queen Seondeok was the firs female to rule the nation, and the broadcaster of previous successful lineups, including ``My Wife is a Superwoman,'' and ``Beethoven Virus,'' will bring the life and struggle of the queen to viewers. As the drama takes place during the Silla Kingdom (668-935), the drama crew set their eyes on Gyeongju, North Gyeongsang Province, one of the most famous historical sites during the era in Korea. ``It is the first time to bring a drama based on the Silla Kingdom, and we will strive to bring historical facts and stories that have never been shown through dramas,'' Park Hong-gyun, the producer, said at the press conference held at Gyeongju last week. Indeed, the franchise will use 25 billion won on production and almost half of it in the art department, from costumes and sets to props. Being the first drama to depict the royalty of the Silla Kingdom, Gyeongju city also offered full support through a memorandum of understanding (MOU), and already promised back up of 2 billion won. Born as one of the twin princesses of the Silla Kingdom, Seondeok grows as a bright young woman but her life takes a turn as Mi-shil, a royal concubine, tries to win the crown by putting her husband Sejong forward for the throne. Queen Seondeok was not only well known as the first queen to rule, but also for her leadership and a keen eye for choosing her forces. Thanks to her foresight, she contributed to the rich culture Silla held and also laid the foundations for the unification of the Three Kingdoms. The cast of the new television series made headlines, as actresses Lee Yo-won, playing Queen Seondeok, and Ko Hyun-joung, appearing as Mi-shil, will show off their charisma and charm to viewers. ``Personally, it's nice to see that there are many period dramas that depict the lives of women. Our drama will show how Queen Seondeok grows as a woman and finally a queen, and the episodes will be distinctive and very different in terms of detail,'' Lee said. Ko will appear as Mi-shil, who dreams of becoming the queen herself, but fails when her plans take a turn with the rise of Seondeok. It was later revealed that instead of the main role of Seondeok, Ko herself chose to be the femme fatale Mi-shil. It is the first time for Ko to appear in a historical drama in her 20-year acting career. ``I thought acting a very clear character in such a drama would be better for me. I'm breaking out of my original roles, which were balanced and had a certain rhythm. It's a fun experience,'' Ko told reporters at the press event. Another reason many fans are raising their hopes is because of the actual drama makers. The writer Kim Young-hyun worked on the hit hallyu drama ``Jewel in the Palace,'' also known as ``Daejanggeum'' here, and brought a new dimension to historical dramas with female characters. Along with producer Park, Kim Geun-hong who worked on ``Jewel'' and ``Lee San, Wind of the Palace,'' will also lead the drama with strong hopes of success. 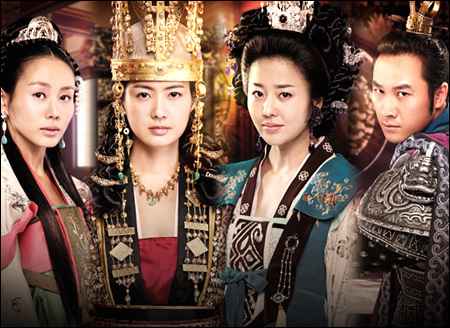 ``The Great Queen Seondeok'' starts at 9:55 p.m. on May 25 on MBC.